As companies across the global economy accelerate investments in digital transformation, service and solutions providers are waging an intense competition for brand leadership in an extremely crowded market. ITSMA’s first annual brand tracking study for providers of digital transformation services and solutions, Positioning for Digital Leadership, helps marketing, sales, and business leaders understand buyer attitudes and beliefs, their company’s brand equity, current and/or aspired market positions, and buyers’ perceptions of performance in this critical market. Building on almost two decades of similar brand tracking studies, this new report documents what buyers are looking for most, which companies have already staked out leadership positions, and the enormous opportunities that still exist for challengers large and small. IBM, Accenture, and Cognizant have risen to the top, but a select group of additional providers, including Deloitte, TCS, Capgemini, Wipro, and HPE, are strong contenders. ITSMA relies on two innovative tools to help companies dig deeper into brand data and analysis and increase the impact of their research investments. 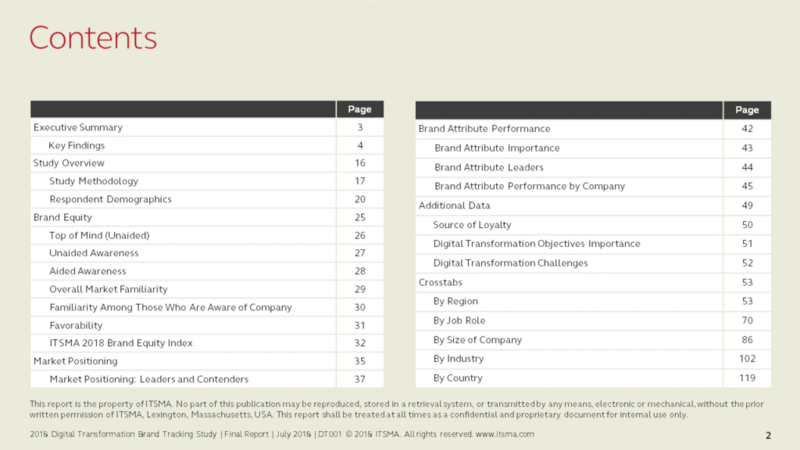 ITSMA’s Brand Equity Index enables companies to construct a single, overall score that integrates a variety of critical brand data points. The index allows companies to track brand strength over time in addition to making competitive comparisons. Metrics incorporated in the Digital Transformation Brand Equity Index include unaided and aided awareness, preference, familiarity, and favorability. 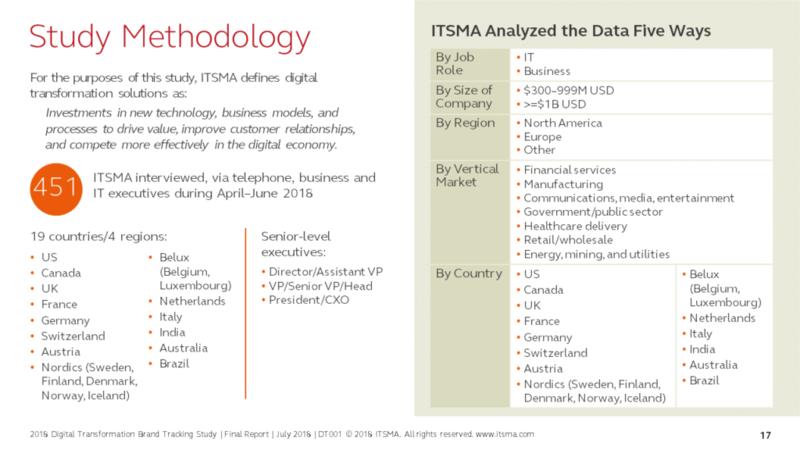 ITSMA’s Brand Investment Matrix maps the attributes that buyers consider most important when considering service providers against their assessment of the way companies are performing in those areas. This mapping helps providers craft specific messages that resonate with the target audience and focus marketing investments in the most efficient manner. Client vs. Non-client Analysis compares the perceptions of clients with direct experience with the provider to non-clients. 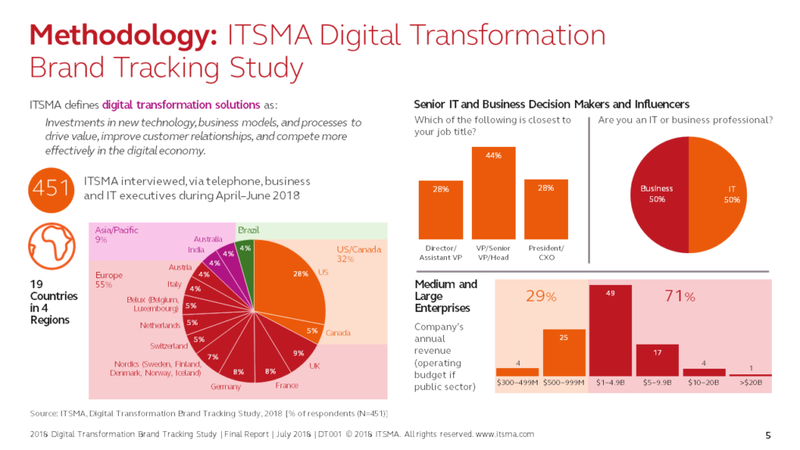 ITSMA conducted telephone interviews with 451 business and IT executives during April-June 2018. Study participants included executives from seven vertical markets in 19 countries in four regions: North America, South America, Europe, and Asia/Pacific. More than two thirds of participants represent $1 billion+ companies. The study was co-sponsored by Atos and TCS, which provided input to the survey but had no role in conducting the research or analysis. This report is available for sale at member and non-member prices. We also have pricing, shown below and on the order form, if you are interested in having a web or in-person briefing on the research results. To order the report, you may either add it to your cart and checkout through our online process (via PO or check only) or fill out the order form and email it to accounting@itsma.com. For either order method, once payment is secured we will send the report online via email as a PDF.